–And what better way to highlight this than to toss a Type-IN for the opening Arcade Party at Philly Tech Week. 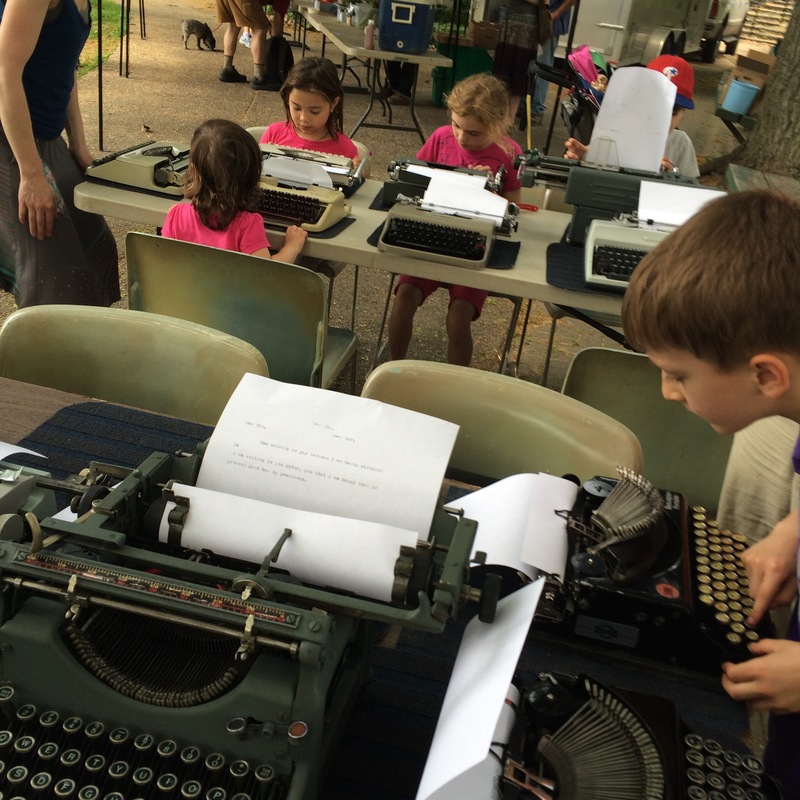 On Friday, 29 April, in Dilworth Park, on the West Side of City Hall, see our analog printing presses nestled among the digitalia. Starts around 5 p.m., Speed Typing Challenge sign up around 7 p.m., goes till 10 p.m.
OK …better borrow the car and snag this one– ” …A little dirty but works. (Non Crashable word processor, right??) These were the workhorse of every office for sure. $30 OBO. Would just hate to throw this thing away…. “ Contact seller and…..
OK, let’s see–ah, a reply…. “ I just found out my dad got rid of it. He actually just threw it away. 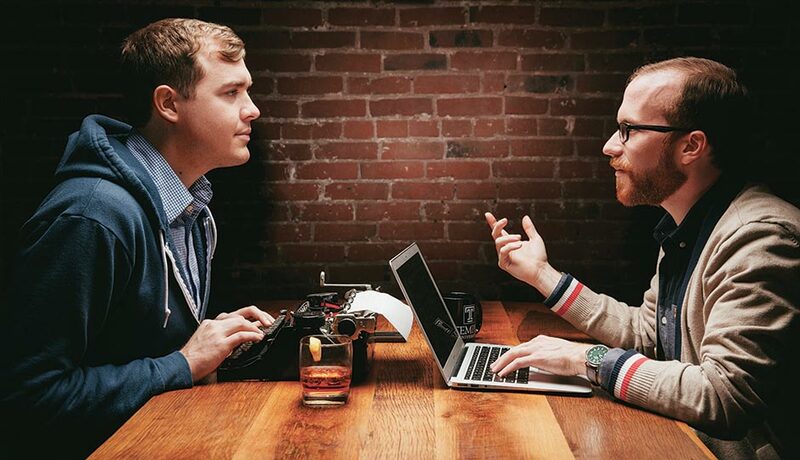 ” 2.5 thoughts: What the hey –the ad was just a week old. Why dost thou torment me, typewriter gods? Oh, and man, your dad must be one really strong dude if he can throw a Selectric II ! This vintage comic pic of a guy getting clocked by a desk top–OW–led to a clear-eyed, cutting essay by author Claire Vaye Watkins about the writing world shaped mostly by white men, and its effects on a woman navigating it. Here’s the link to the Newsworks story. 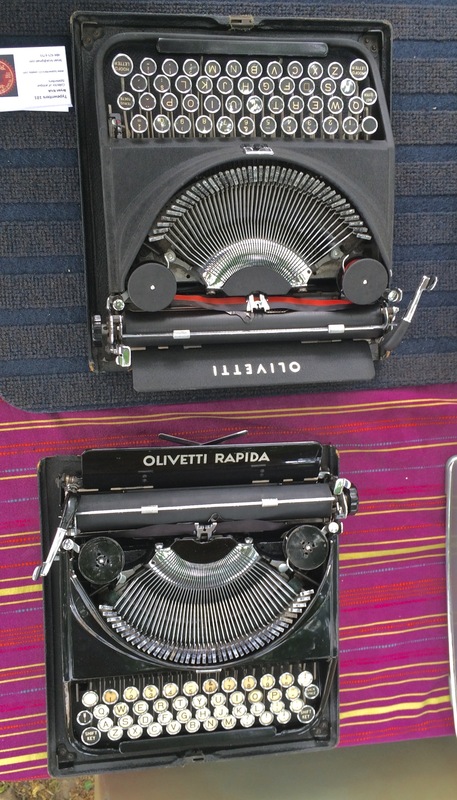 Bryan Kruk always brings some lovely machines; here’s a pair of Olivetti ICOs — one in matte black and one in a glossy piano black. Bellissimo, Mr. K! Ah, such a crisp design could only foster concision! 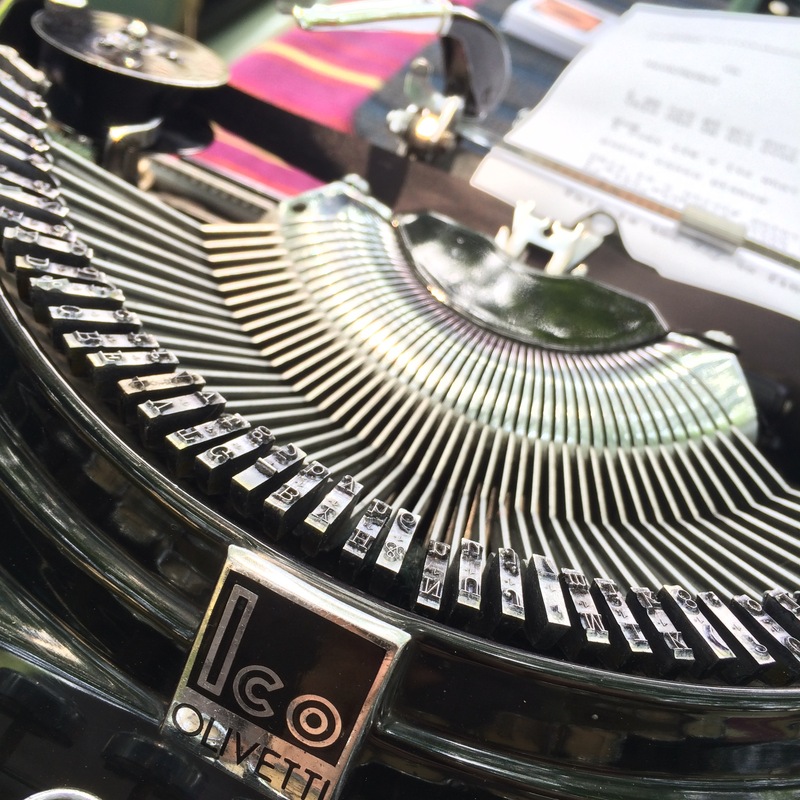 Let’s have a closer look at that OLIVETTI ICO, shall we? What’s really astonishing is that this machine types as beautifully as it looks! Thank you, men and women of Olivetti, S.A.
At Lucky’s Last Chance in Manayunk; typing up the agenda for Saturday’s Type-IN! 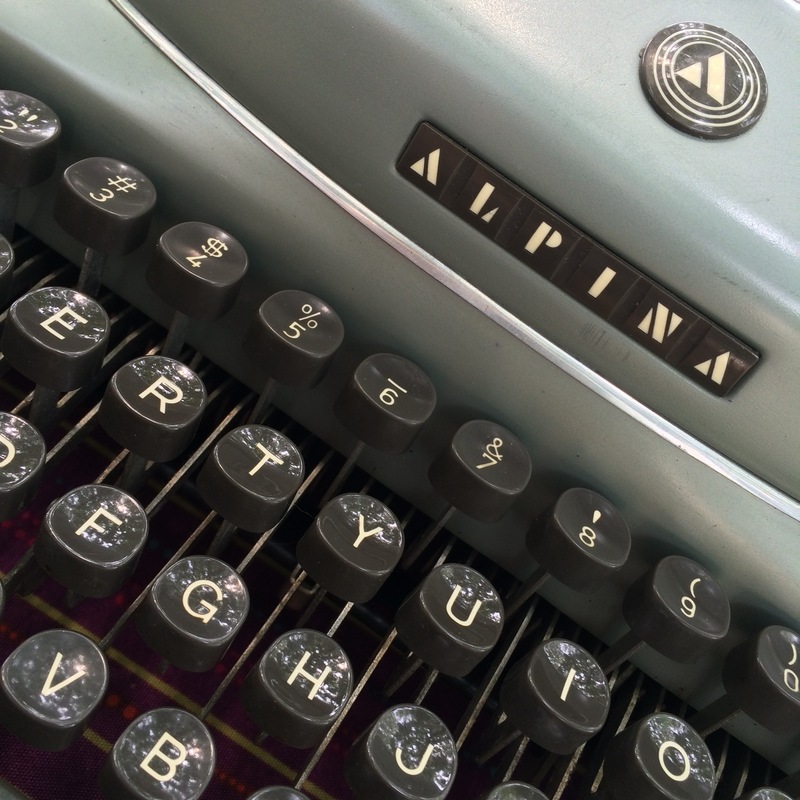 (Olivetti Lettera 32 fueled with vintage Anheuser-Busch letterhead. Tomorrow: gather up chintzy prizes for the Speed Contest, ha.